New!! Finish Options - Give your Macbook, iPad, iPhone and Microsoft Surface a unique and distinctive look. 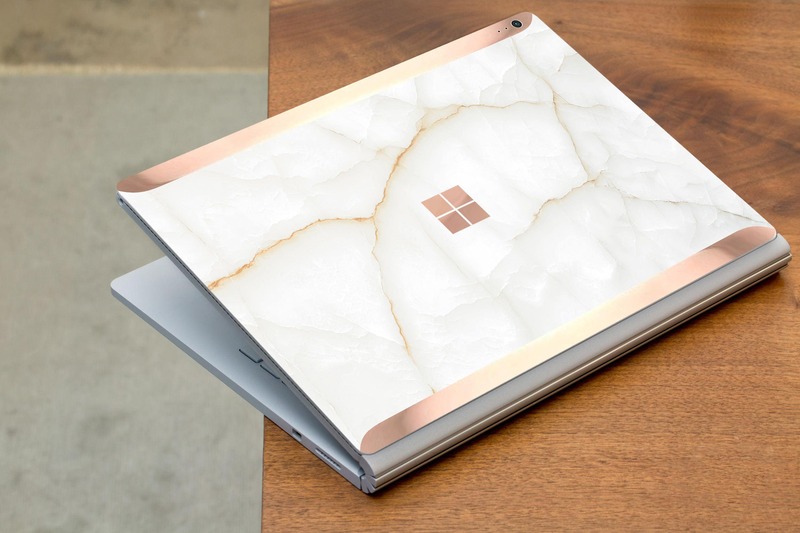 This is not a Hard Case, it's not a sticker, it's our Professional Platinum Edition Vinyl Skin, it adheres directly to your Surface book and can be removed without leaving any residue. Rose Gold detailing is made by a double layer of vinyl skin, a top layer and a rose gold chrome layer underneath, we then create precise cuts on the top skin to expose the rose gold from the layer underneath. Pro-Vinyl, Laminated & Cut to precise Microsoft Surface Measurements. What is a Vinyl Skin? Clique Skins are low-profile, laminated vinyl decals designed to protect and personalize portable electronic devices. Made of premium automotive-grade cast vinyl with a special adhesive backing to prevent air bubbles during installation, Clique Skins provide protection against scratches and everyday wear-and-tear. The adhesive is re-positionable, and will not leave any residue upon removal. 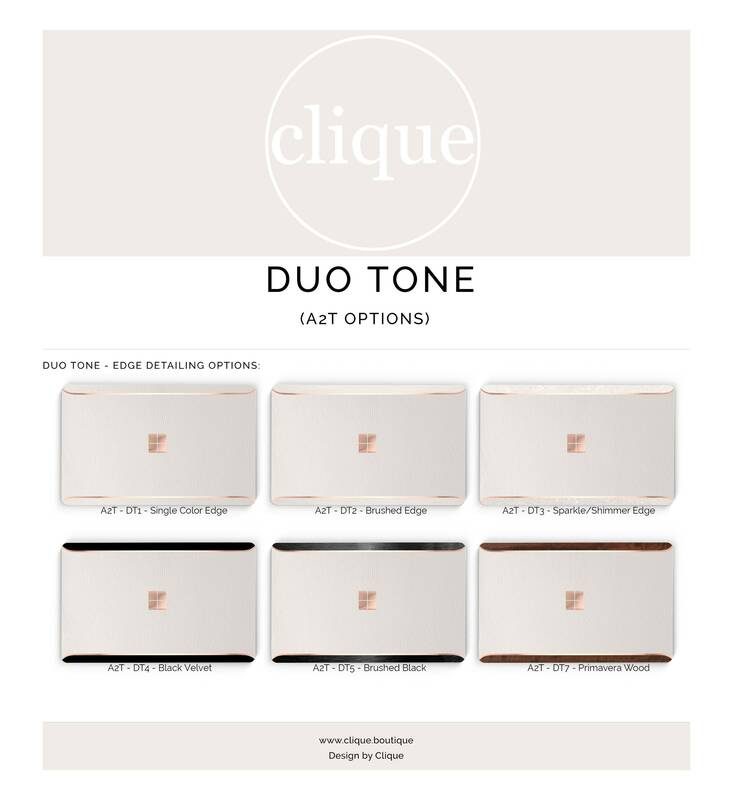 Clique skins are the lightest, thinnest & easiest way to protect your device. What is Matte? Matte finish is a non-glossy, satin-type finish. It allows fingerprints and smudges to fade into the surface of the skin and gives a unique look and feel to the artwork. What is Glossy? Glossy finish has a shiny, glossy, appearance and the colors within the artwork may seem to be more vibrant. 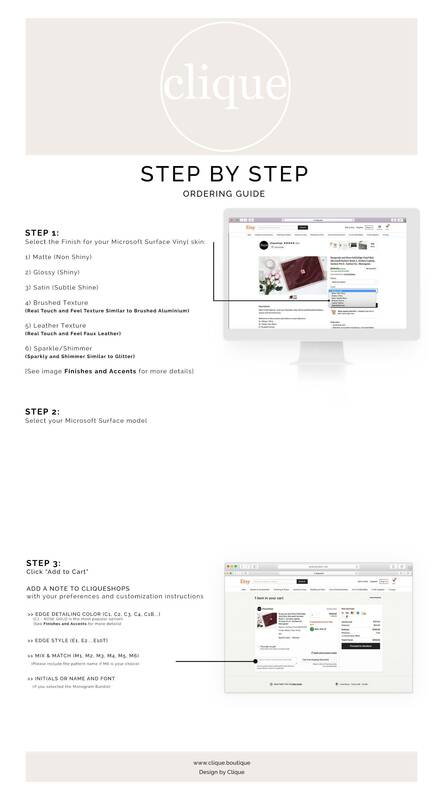 All of our products are made shortly after your order is placed. All of our materials are sourced from local suppliers, right here in the USA. Each country has different laws that apply to imported products, some countries will charge additional custom fees at the moment of import, this is not included in our price or shipping costs, the payment of this duties are directly to customs in your country. We ship WorldWide, our production time for each order is 10 business days, we make each order under demand, this assures you that your case or skin is "hot from the oven" every time you order. Upgrade shipping options for faster shipping are available at checkout. We are here to make you Happy! You will Love our Product, it's guaranteed. If you are not completely happy with your purchase -- for any reason and would like to exchange it for another design, please send us a convo and we'll find a way to fix it. Since products from Clique are made to order, products cannot be returned for refund. If you are not satisfied by defects on the products (such as scratched cases or printing), please contact us for assistance and our team will review the problem and arrange an exchange of the product with a new one if necessary. How do I know what Macbook model I have? How long does it take to make and ship my order? We do our best to have orders produced and shipped within 10 business days for Macbooks and 8 business days for iPad/iPhone. Please do note that larger orders, can take a few days longer. Don't hesitate to send us a Convo with any questions about how long your order might take. What are Clique Skins Made of? 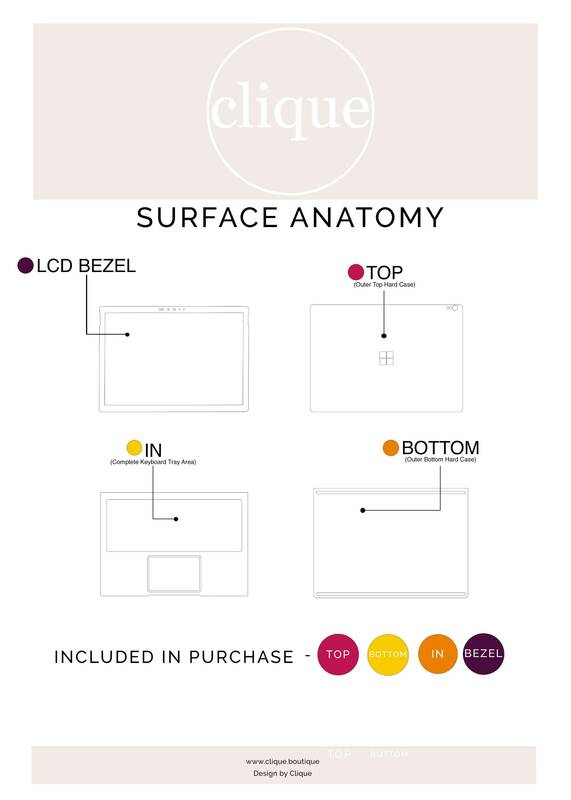 Clique skins are made of premium automotive-grade cast vinyl with a special adhesive backing to prevent air bubbles during installation and leave no residue when removed. Our skins are strong but super thin, measuring about 5 mil total - or five thousandths (0.005) of an inch - that's thin! It also means they'll work with just about any kind of dock, charger or case on the market. I messed up installing my skin, can I get a replacement? YES!, We totally understand accidents sometimes happen during installation, and if you've damaged your skin during installation we'll send you a new piece for free - you just need to cover the return shipping charge. All you have to do is send us a Convo and request a replacement skin. What is a Platinum Edition Hybrid Hard Case? Our Platinum Edition Hybrid Hard Case, is made using a Crystal Clear Hard Case, we then professionally hand-install our Pro-Vinyl Skin on top the Hard Case. How do I apply my Platinum Edition (Inner Skin)? How do I apply my Skin? How do I remove my Skin? All Clique skins should peel off pretty easily by pulling on them gently and slowly. They won't leave any residue behind, so that shouldn't be a concern. If for any reason you have a problem or it seems difficult to remove, we've found that applying a little bit of heat (sunlight, a lamp or a short shot of heat from a blow dryer) really makes removal much easier. Macbooks skins come off easiest when the lid is closed. Sorry, they're meant for one time use only. Our skins are not sold as reusable as they are meant for a one time use. They are adjustable during the application process but once they have bonded you more than likely will stretch the skin when you remove it. You can certainly change them up at any time as they are removable at any time. Can I request any edits or text on the artwork? You can add text to any design including your name, your favorite quote, a Monogram, or even a special birthday message - printed right on the skin itself. Just send us a Convo and we'll get right to work on your custom order. What's the difference between Glossy and Matte Finish? Matte finish is a non-glossy, satin-type finish. It allows fingerprints and smudges to fade into the surface of the skin and gives a unique look and feel to the artwork. Glossy finish has a shiny, glossy, appearance and the colors within the artwork may seem to be more vibrant. Looking for a very special gift? Make it Personal and let them know how much you care. I love the design and makes my laptop even more beautiful to me. It would be helpful if the rear/front was marked because I removed the vinyl several times trying to get it adjusted. I do noticed that if I write on top of it, it will leave an imprint of whatever I’m writing so just be careful with that. Overall, it’s worth the buy - I’m happy to be helping your son with his needs!